As a quick overview of this trip, we spent 100,000 Delta points each plus under $200 in taxes to fly. We flew from South Bend to Atlanta, overnighted, and the next day flew on to Sweden via Stuttgart + Amsterdam. After a nice visit in Sweden, on the way home, swung by Italy with KLM. Our trip home, that I will cover tomorrow, was Boston and Atlanta on the way back to South Bend. We paid for the hotel mostly on points but this month long trip was not free, as we did spend in Sweden and Rome all in about $1400. Keep in mind points travel is rarely 100% free but just greatly discounted and for us to have family to stay with saved us a ton of hotel points 🙂 .But now on to Rome. I don’t want this to feel just like just a Facebook post so I will try to cover some thoughts as a first time visitor to Rome (It was not my first time, but my first time as an adult). We also are not the kind of tourists who have to see EVERYTHING in one visit. I have enough points to go back and will make that happen some time again soon since routing via Rome works with Skyteam. Day one we had just two goals, see the Pantheon and the Trevi Fountain both close to each other. 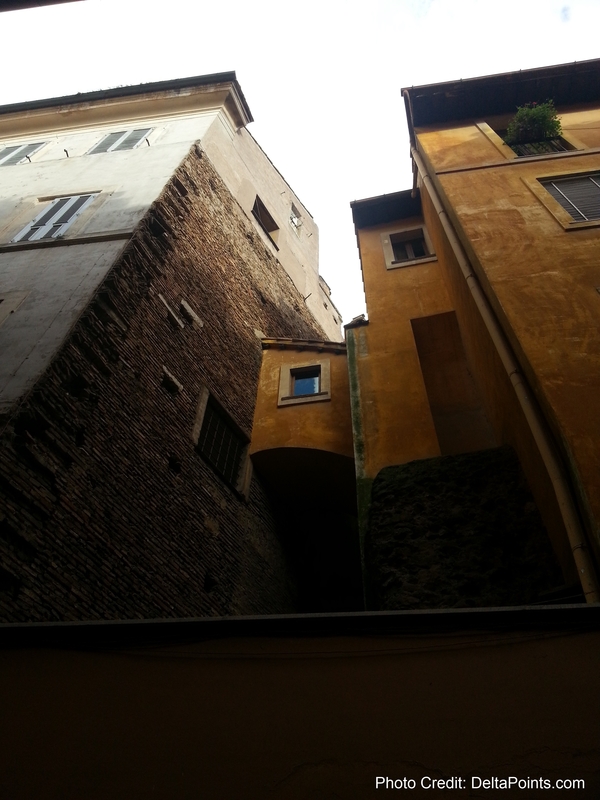 The rest would just be see whatever we found along the way as that really can be a fun way to see a city as old as Rome. One of the koolest things about Rome is they have free public wifi in many places throughout the city. Also, most restaurants will let you use their wifi free when you buy anything at all and an excuse for a cappuccino is always nice. I loved being able to use the GPS walking map in spots to make sure I was sorta where I thought we were. The first part of day one the sky decided to “flush” Rome. It did not rain a little, it rained dogs, cats, sheep and water buffaloes! I mean it rained hard. We had great umbrellas, back in our room at the hotel, but the forecast was for just scattered showers. Ugg. (I know mom, always bring an umbrella)! After hiding in doorways and buying some “cheap” umbrellas we made it to our goal mostly dry. 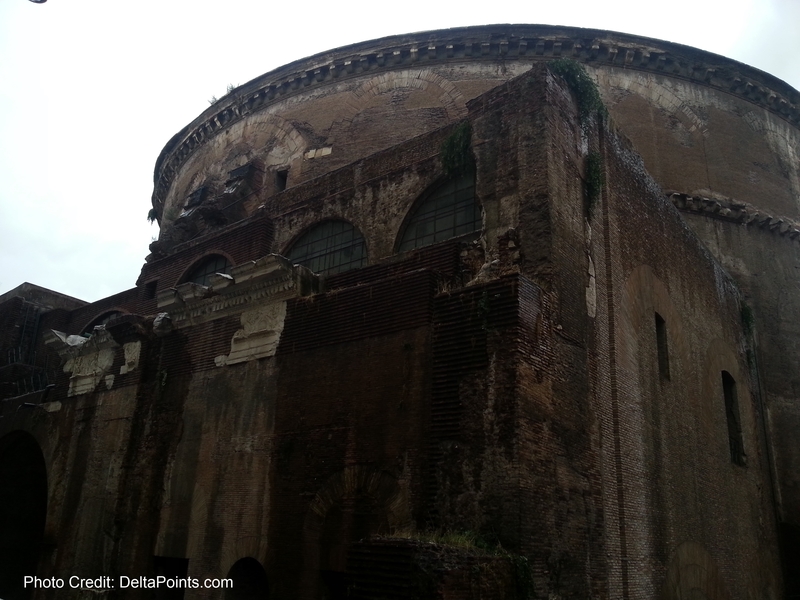 The rain really started to pour once we made it to the Pantheon but that was fine as it made the rain coming into the open dome even more kool and impressive. 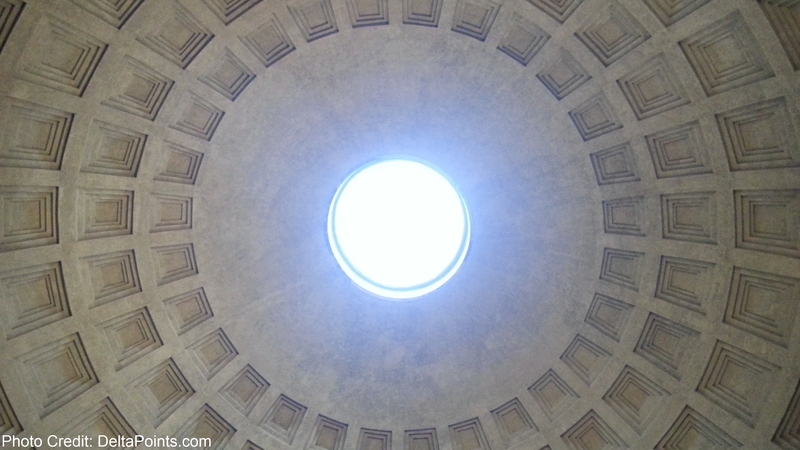 The Pantheon is amazing. 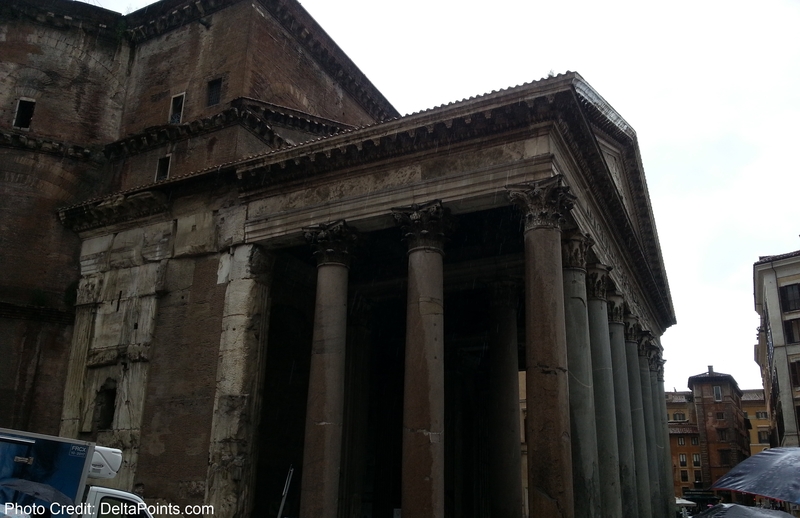 To think it is 2000 years old and one of the most intact structures in Rome is stunning. 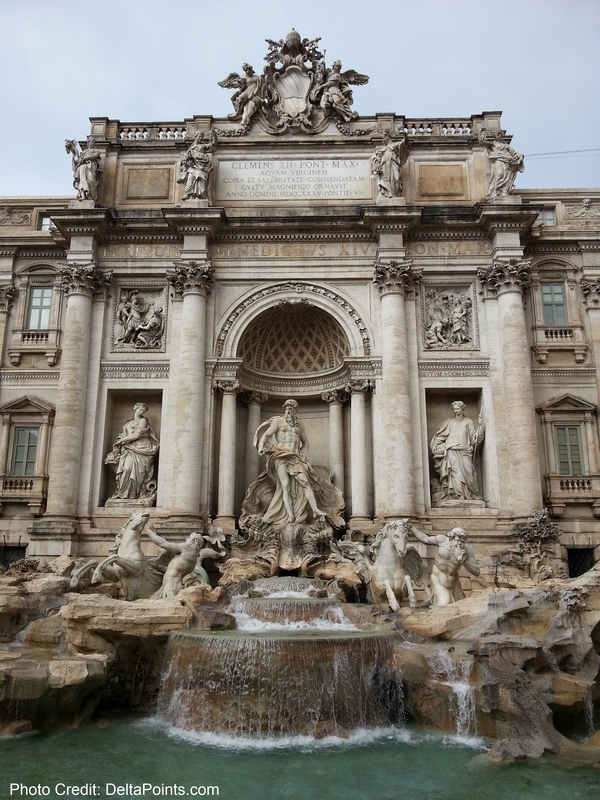 We enjoyed some time at the dome and waited for the rain to stop and then pulled out my phone, connected to the free wifi again, and got our bearings to the next goal the Trevi fountain. I am all for walking in fun cities. 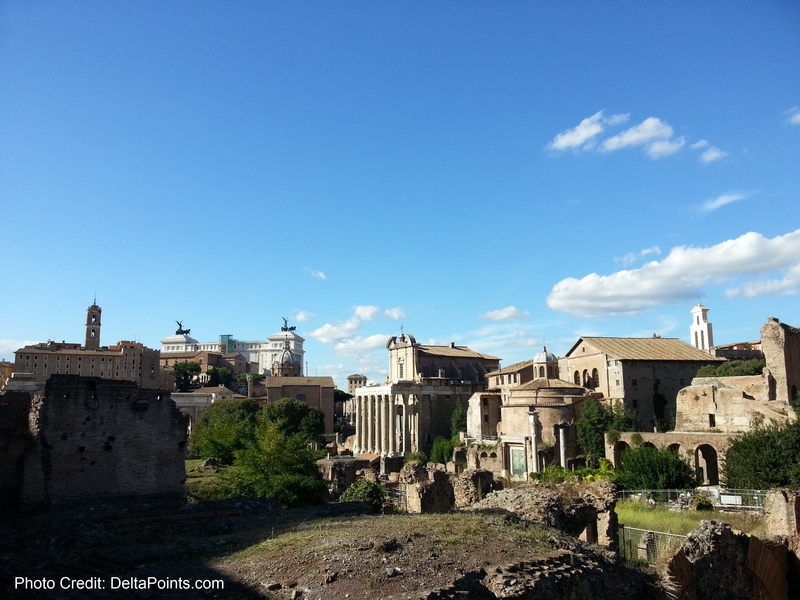 Rome is a walking city to me. Everywhere you look there is something to just stop and wonder at. If you tram or bus you will miss things. Bring good shoes. The above for example. All over the city there are running water spouts that just – run! People use them for all sorts of things. I mostly used them to wash my hands but people would fill up drink bottles and whatever. Just neat! We wandered to the fountain, stopping in and by little shops. Lisa got a nice scarf and I, in a few shops, got 3 silk ties. I was most happy. This is one big fountain. The square is big and even in the misty rain was packed with people. After our fountain visit it was time for a break with the sun at last coming out. After this much walking we needed a break and to dry out so we had a snack and a bottle of wine. Very nice way to spend the day I must say! The rest of the day we just looked at the city. Found more neat stuff and popped in for a Gelato and just enjoyed the walk. 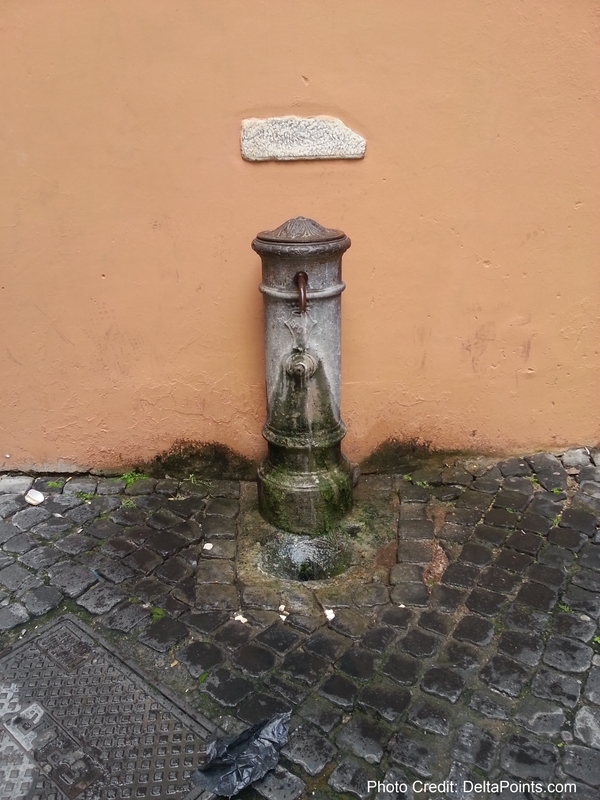 There is just so much history in Rome everywhere. 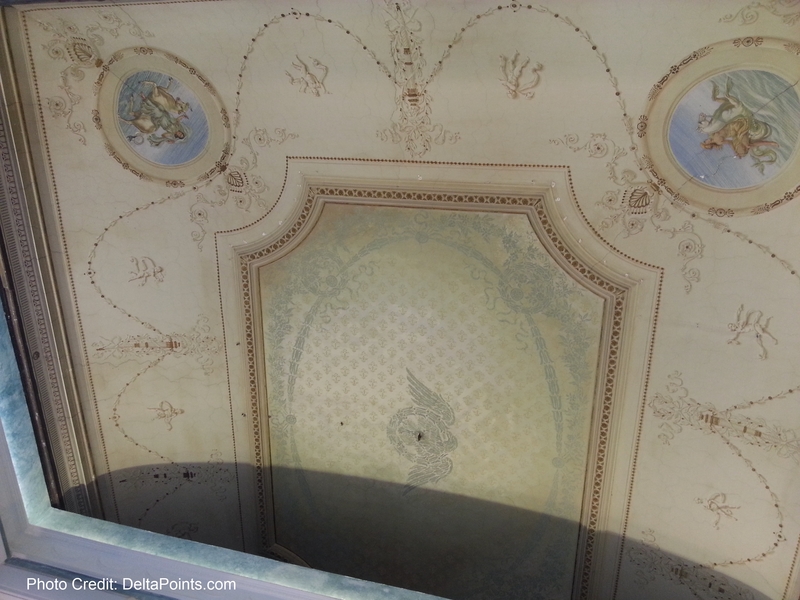 The roof of the ice cream store must have been a nice home before it was a Gelato store. So take the time to look up when you sit down. On our way back I was reminded by this little street and how happy I was that I was on foot and not driving around let alone trying to find a parking spot. That ended our day one adventures and we headed back to the Sheraton for the night! Day two we had two more goals in mind. 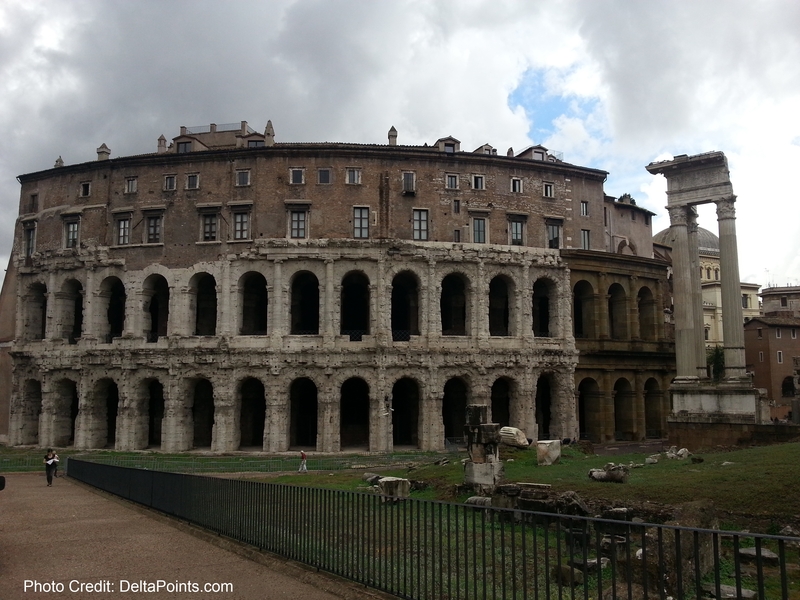 The Colosseum and the Forum. That would be a full day. 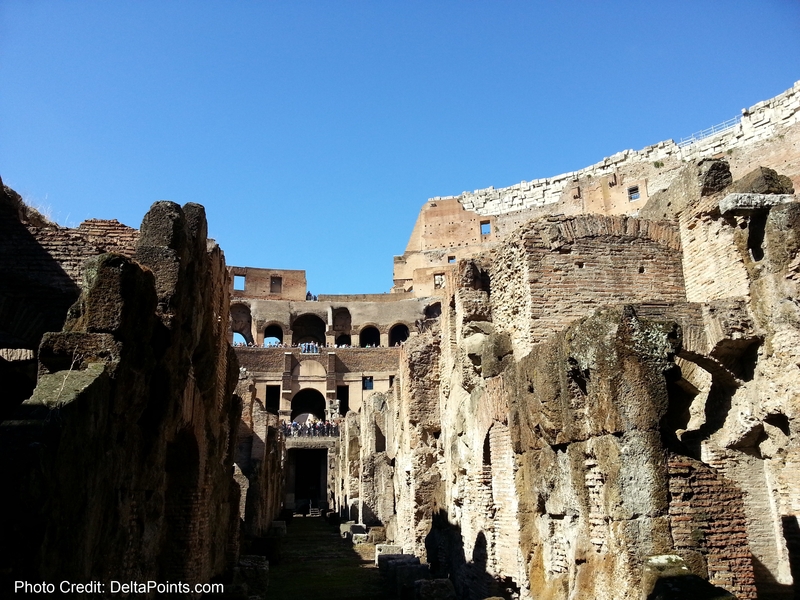 Thanks to blog reader David from Gothenburg we did NOT have wait for hours in line for our Colosseum tour. We purchased online, not just the std entrance fee, but the upper and lower chamber tour! 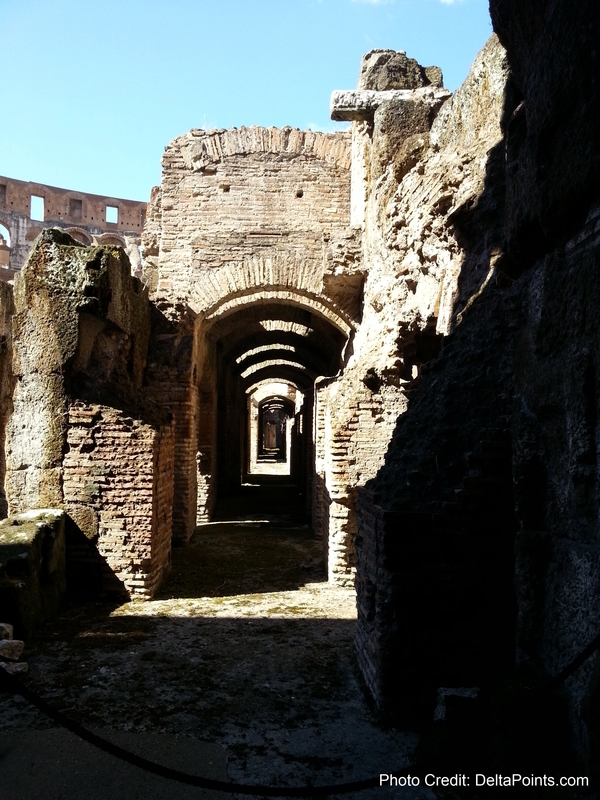 I was hoping to be really impressed by the Colosseum. And you know what, I was. First, as mentioned, left of where 2000 people were in line is something like a Sky Priority line with Delta. We went all the way past all the crowds right to an open group sales window and right into the Colosseum while we waited for our PVT tour. I say PVT as our group was no more than 20. We started with the underground floor. It was amazing. I can not imagine being down there with no light, smoke from torches, animals in cages and on and on. There is way too much to tell all about. Just know you need to take the full tour not just the stock entrance fee to walk around. It is well worth a few extra bucks! The basics, the flooding of the arena was before what you see now was built and was only for a little over a year. There were two levels underground and it was tight quarters. Surreal. 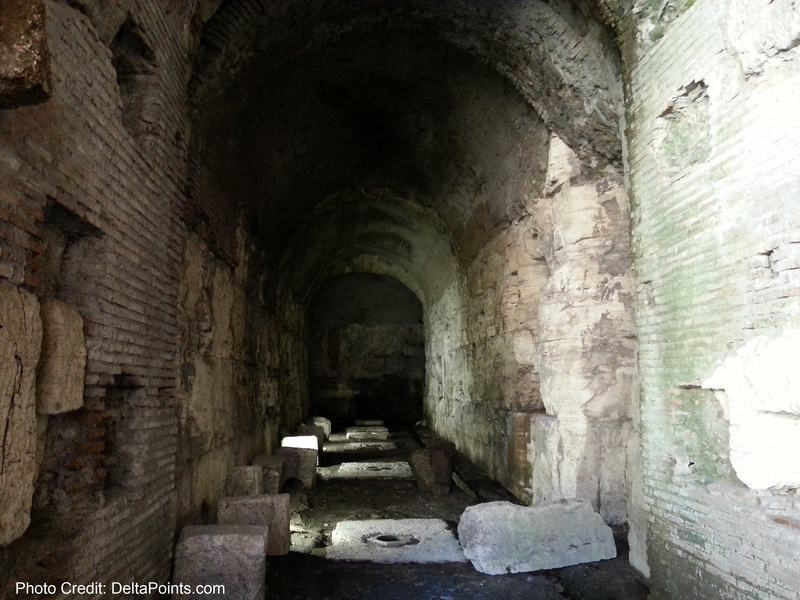 There were many elevators and trap doors to raise people and animals to the floor level above. Stuck down there all day running the ropes, oh my! Then we went up to the 3rd floor as the 4th floor is closed as they work on the structure. The views from up high are amazing too. Everywhere you look there is history. 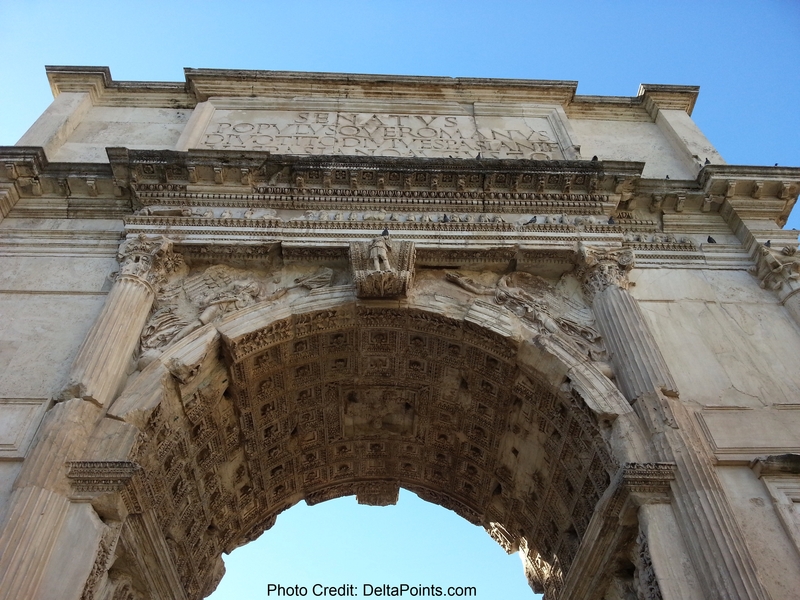 After the Colosseum we looked around at the Forum and what you see above is the Arch of Titus. There is just so much there is no way to cover it all. It was all amazing and hard to take it all in. 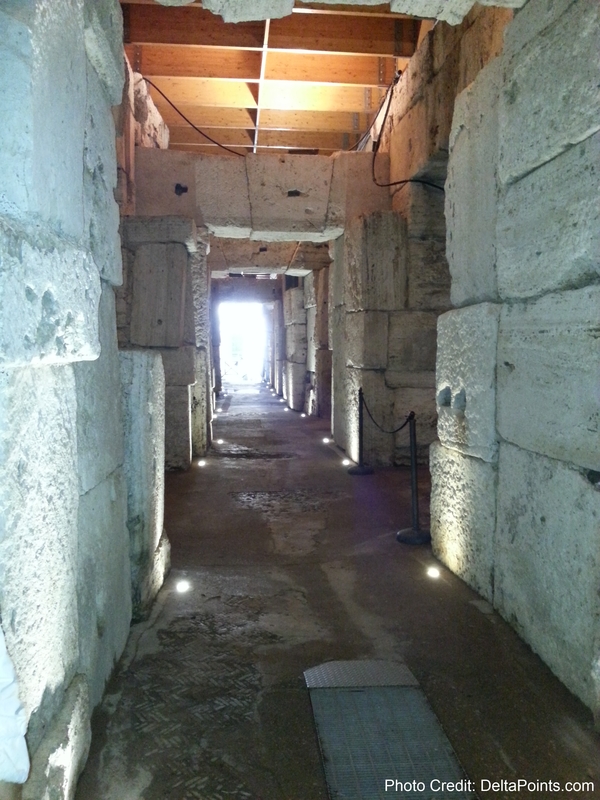 Our online ticket included not just our tour but also access to the Forum. After all this we found a nice spot to have a delicious pizza dinner before heading back to the Sheraton shuttle to our hotel and flight home the next day! We really had a grand time and with so much to see, I look forward to many more visits to this cradle of civilization. Final thoughts. Check the forecast :-), make sure you have good shoes and a good map either on paper or on your phone. 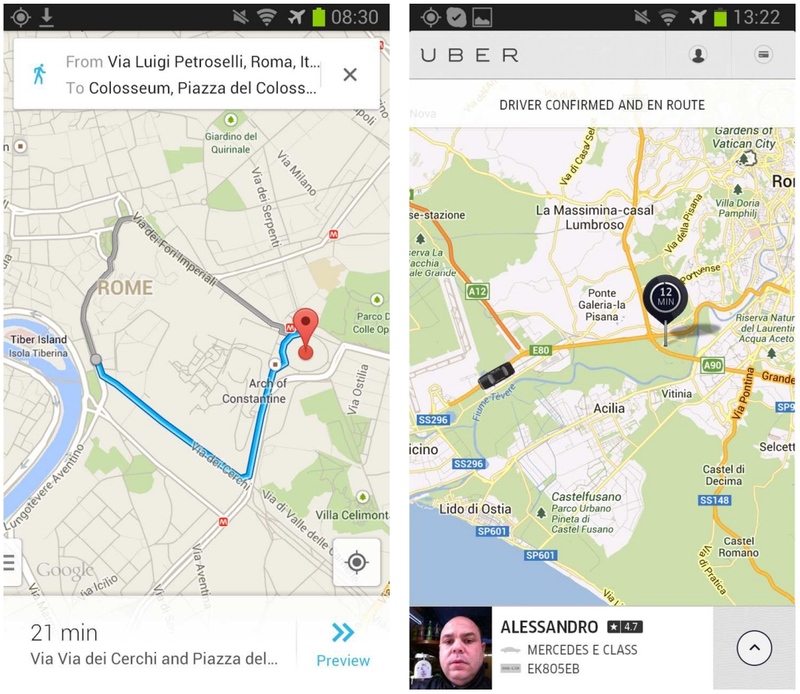 UBER does work in Rome and at the airport if you need it. 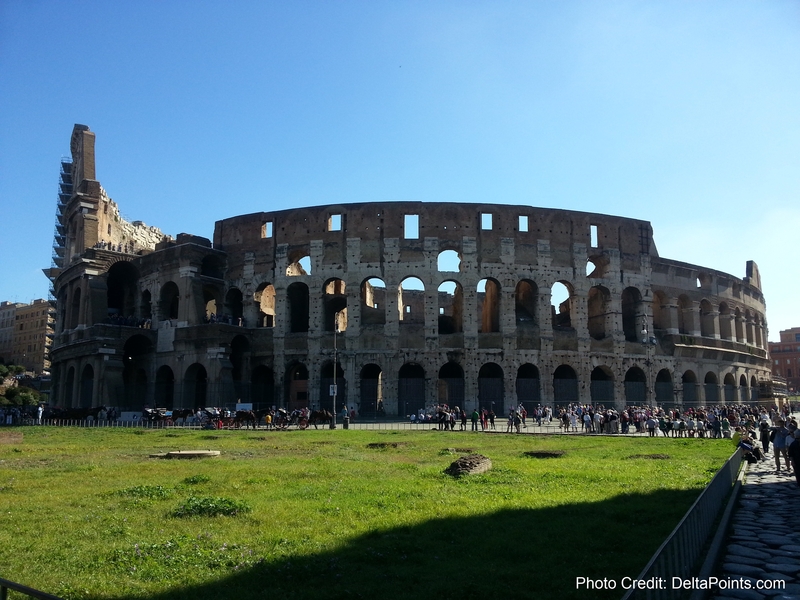 Most places will take cards but have some cash and as always pick a card that has NO INT transaction fee; I used my Chase Sapphire Preferred® Card in both Sweden and Rome but the Barclaycard Arrival™ World MasterCard® would be another good choice. I was warned often about pick pockets around and we were very careful and kept things in our front pockets only. Great reading about your trip…brought back memories! @gussomer – txs I enjoyed your report a ton too! Sounds like you had a great time in the Eternal City. We went for the first time about 2 years ago and loved it. See you this weekend in Chicago! I love all of your panarama shots! What camera/software did you use. Looks like you had a great trip! 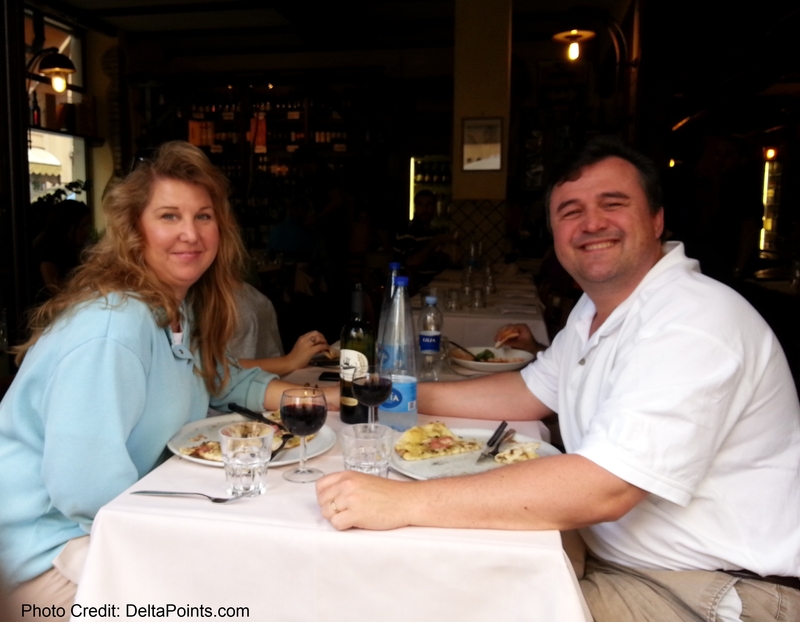 I used Delta Skymiles for a trip to Rome last year. @Craig – built into most Samsung phones. Just go to the settings and rather than single pick panoramic and it joins them (most times). 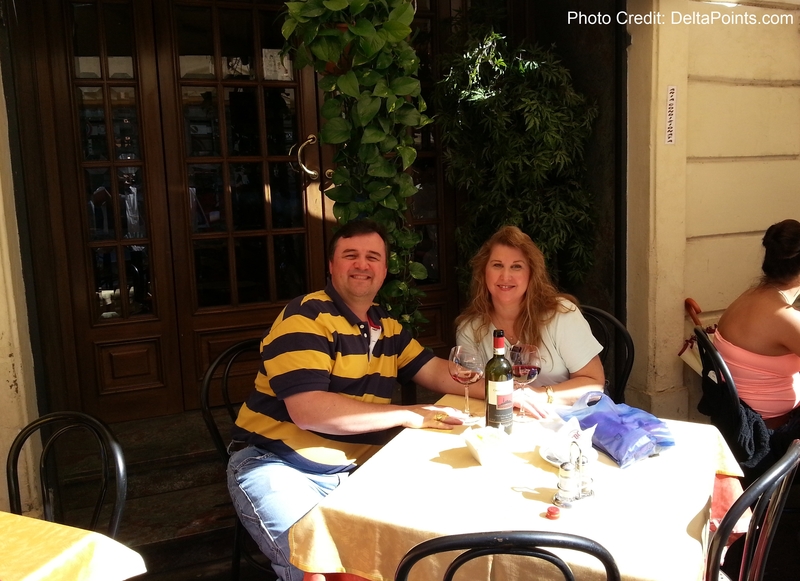 We went to Roma and Paris last March also using 100K each Sky Miles. Great value. However, going forward trying to find low, pardon me, Saver level, on DAL to Europe in BE is nigh impossible. I have no issue at all with 125K for BE. But only if DAL replaces those crappy A330-300 cradle/standup seats with lie flats. That appears to be the case by 7/1, maybe earlier. It seems as if the ATL-FCO direct might be last holdout with the old CAL seats. DAL 240 to be specific. Who did you use for Colosseum tour? Walks of Italy? 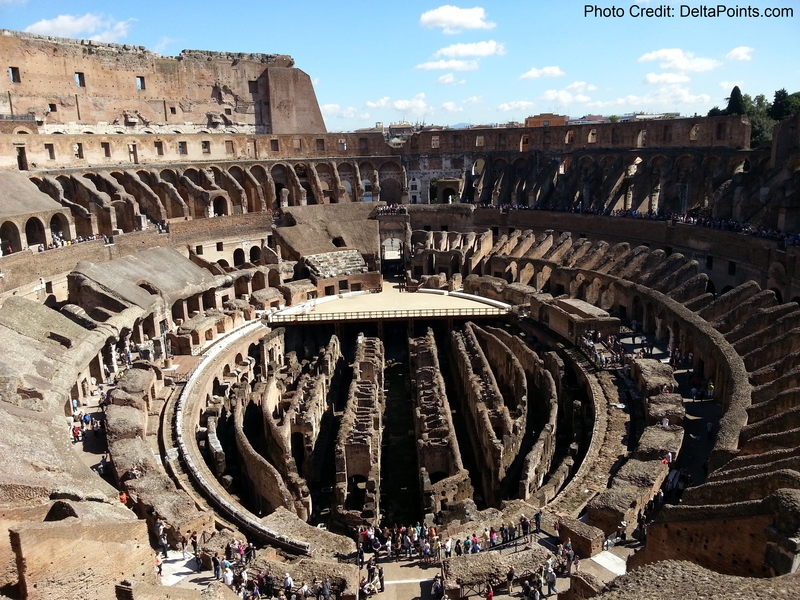 Or just the regular Colosseum site? Thanks for taking the time to share so much. 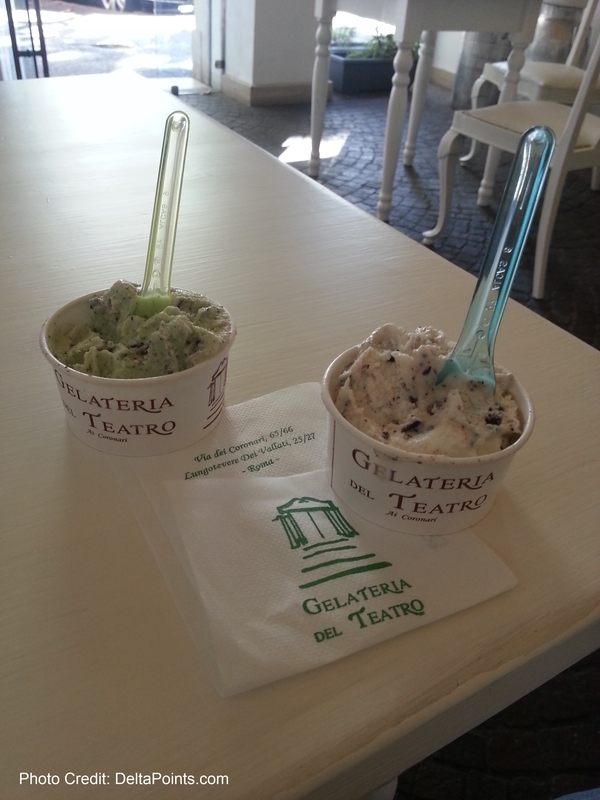 I was in Rome this time last year and this brought back great memories! 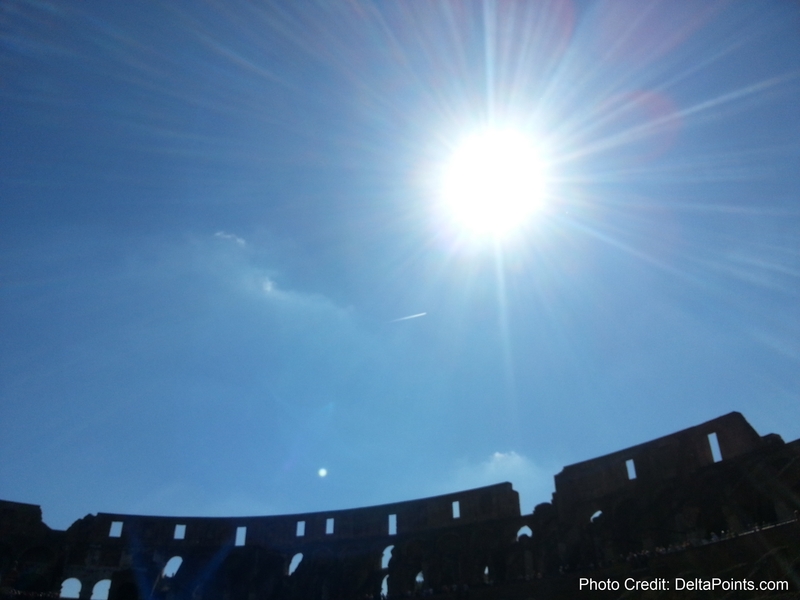 @Ben – http://www.tickitaly.com/ as the Colosseum site was down for booking.